There is a No Croutons Required tradition that December's No Croutons Required asks for photos instead of recipes for soups and salads. Everyone is so terrifically busy in December, so Lisa and I think it is time for a bit of fun and a chance to see what the festive period means to different people. I do hope you all enjoy the roundup and have a wonderful Christmas. "Dark, rich, chewy and moist, this may be the best Christmas fruitcake you've ever had — I can say it's by far and away the tastiest I've ever eaten." "I just got a new donut baking pan so I was excited to put it to use. The donuts were super simple to make and so was the chocolate glaze. The girls all decorated their own donuts and loved them." Claire sent me a lovely photo of her children getting ready to go to church last Christmas Eve, when we had all that snow. Don't they look smart? I was lucky enough to meet Claire last month at Bite n Write in Birmingham. We all had a lovely day of workshops, followed by drinks, then a meal at Jamie's Italian restaurant. It was great to meet everyone. Everyone was so friendly and Claire was just the sweetest. 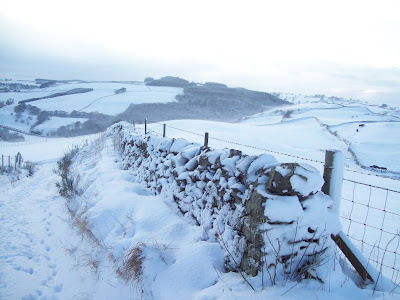 "It was taken on Hogmanay 2009, about a mile or so behind my parents house in Hawick. I was about 10 weeks pregnant and had awful morning sickness. I'd spend virtually all of the Christmas holiday curled up in a chair feeling miserable, trying and failing to keep down dry toast and generally being a scrooge. On the 31st December Mr E eventually cajoled me into going for a walk, and we made it about a mile to where this picture was taken. I'm pretty sure he also cajoled me into taking it - I think I was participating in the walk in body only, and moaning about it all the way, but looking at the photos I took afterwards, I'm glad I went - it was a stunning day!" "The photo was taken last Christmas morning, at about 7am, I was the first one up and the the living room was glowing pink from this beautiful sky......there was a smell of candle wax and the air was heavy with spices from the plate of mince pies I had just warmed up.....the tree lights twinkled and the moment was magic......I grabbed my camera and 3 minutes later, the pink dappled sky has disappeared......but I captured it." "You may wonder about Christmas in Australia where our nights are too long for light displays and the blazing sun is no place for snowmen, winter woollies and hot ovens. 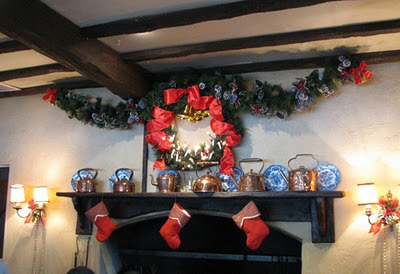 On the weekend, we had a lovely dinner of festive fingers and Christmas pudding at Miss Marples Tearoom. It is decorated traditionally as is the above Christmas tree in the Royal Arcade. We even have lots of traditional Christmas brick-a-brack in shops such as Tealeaves." I cannot believe the last year has gone in so quickly and how much Cooper has grown and learned in the last year and just how bald he was last year. This is a picture of Cooper playing with one of his Christmas toys. 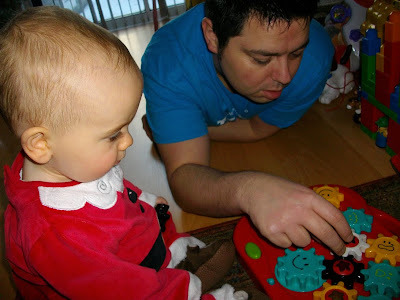 His uncle gave him this and he just loved all those moving gears. Such a boy! "I took this photo of the sun setting last year on Christmas day, with just a sprinkling of snow visible on the rooftops in the foreground. Snow is most unusual for the northwest of the UK, so I doubt I'll get a chance to capture a scene like this again, and on Christmas day itself! It reminds me of the lovely day I had shared with my family, and how lucky I am to be able to do so." 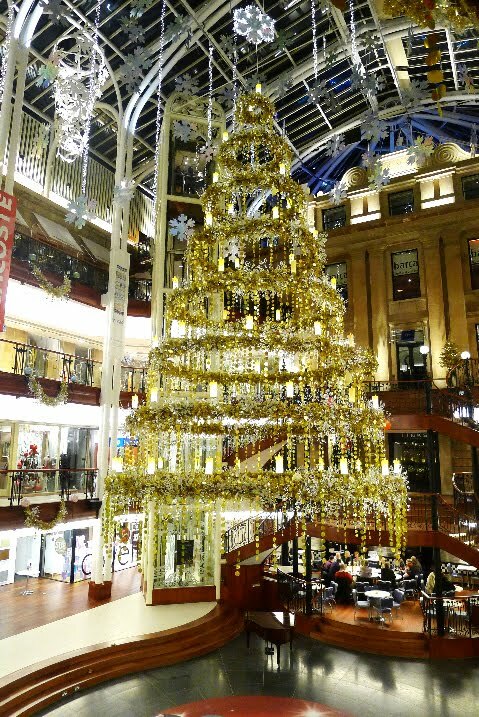 "I was out for dinner in Glasgow on Saturday night and took this image of the hanging tree in the Princes Square. I love Christmas lights and they created a lovely atmosphere in the centre. I'm quite pleased with how this picture turned out, and it makes me keen to keep taking photos and to keep learning about photography." "I'm not a great fan of rock candy, I don't care how classically Swedish these "polkagris" (= polka pig, peppermint rock) candies are, I've never enjoyed them. (Well apart from when they're mixed into Marabou chocolate, then it's all mmmm...). These have been stuck in the pantry for a year now, I've been meaning to put them into cookies ever since. The time to finally do that has come. My weekend will hopefully consist of the baking of these cookies, food shopping, thinking, writing, knitting, preparing for the kittens - only a few days left now! - and a visit to a nearby Christmas fair. That sounds more than alright to me." "This is the aptly named 'Winter Hill', we live to the left of the church, as the crow flies." A late entry from Dom over at Belleau Kitchen. The silly sausage forgot to email me and I missed the post. 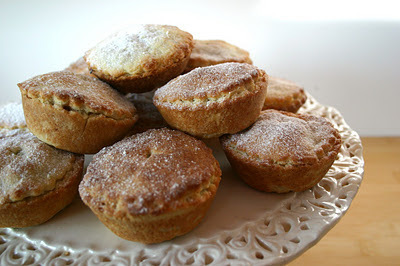 Oh well better late than never and lovely looking mince pies Dom! 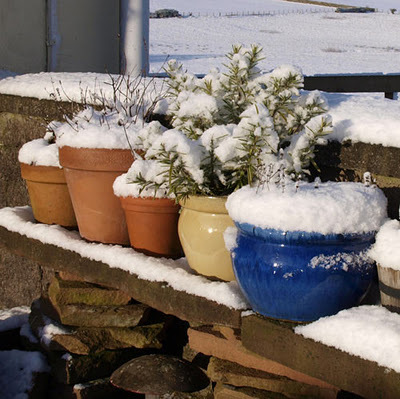 Another late entry, this time from fellow Scot Janice over at Farmersgirl Kitchen Janice titled this photo 'Frozen Herbs'. I just hope we don't get too much of snow like that again this year. although, you have to admit it is pretty. Well that's all our festive photos for this year. I hope you enjoyed them as much as I did. Be sure to visit each blog and say hi, especially if you have discovered a new blog in the roundup. Making new friends is such a nice thing to do at Christmas. Oh and don't forget to vote for your favourite. So sad i missed the deadline. I have the photo but need to plug in the hard drive as I has to remove so much stuff to process video. gorgeous photos - such a great idea for the december challenge as it is a joy to see at this time of year when I have been eating so much good food that I don't know that I need to see any more! Thanks for hosting such a lovely orundup. My vote (s I cant vote for myself :-P) goes to Winterhill - such a lovely picture. I went into Glasgow city this weekend to capture some Christmas cheer, have soem photos to share but missed the deadline - gggrrr. Oh never mind. Nice to see different meaning of Christmas for fellow bloggers. I am a sucker for oranments at Christmas, so my vote has to go to Pia K.
What a lot of lovely Christmas photo's, the snowy ones are my fave to look at (not to try and live a day to day life in though). There are some lovely photos here Jac, thanks for doing the round up! I love them all, but my vote goes to......hmmm.......it's hard, but my vote goes to Ruth and A Snowy Hawick, in the Scottish Borders! Best wishes to you and your family for the holidays and new year. Can't tell how glad that all the snow photos are from last year!!!! !